As the weather gets more pleasant, it’s time to make your wish list of rooftop dining spots in the city. Whether you’re looking to catch up with friends, host a family dinner or enjoy a quiet date night with bae, you need to bookmark these places for an unforgettable scene. With good food, cocktails, beautiful ambiance and a host of services – text your loved ones and start planning now! En is a Japanese specialty restaurant set against the backdrop of Qutub Minar. Its cosy ambience, friendly service and ingredients that travel all the way from Japan makes this place a must visit. If you have been looking for a date night with bae, give this place a chance, and trust us, you will come back. #LBBTip: While you are out with your friends, use the American Express Membership Rewards Credit Card and utilise their generous points accelerators that’ll allow you to earn extra rewards on shopping. The old world charm comes to life at the Lakhori restaurant at Haveli Dharampura. Snake through the lanes of Chandni Chowk and enter through the courtyard of the Haveli to reach the restaurant. 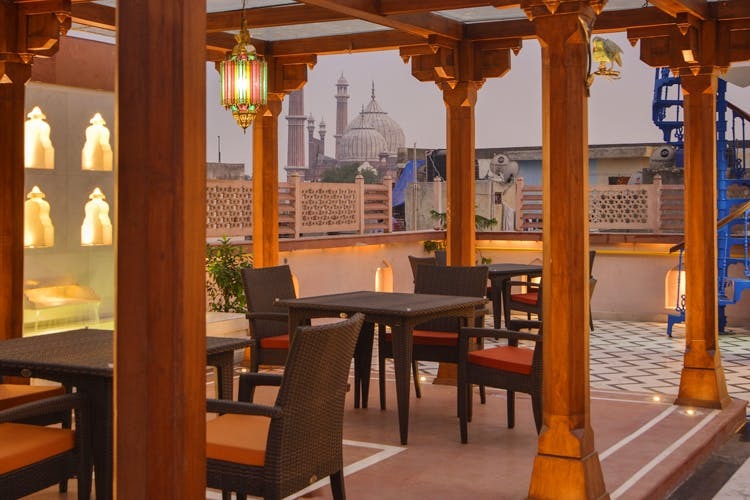 The décor and ambience is reflective of the rich Indian culture and so is the food, but nothing beats the view from the terrace. The Patanga Sangira is a must try here. #LBBTip: Book in advance with American Express using the EzeClick option. Why? Because we hate filling lengthy card details and passwords every time and want to avoid the transaction hassle. Sign up to get one ID which you can use anywhere to shop online. Noida gets perfecto with Imperfecto. Looking for live music, soothing vibes and good food? Imperfecto in Noida gets it right on all three counts. Add to that an extensive bar menu, rustic décor and a huge open terrace; head here for a memorable evening. #LBBTip: Lost your card? Select American Express for they issue a replacement card within 48 hours, and also caps the fraudulent card transactions at INR 1,000, so yeah you are protected with American Express. Baris feels like it was born straight out of the Arabian Nights. The authentic Middle Eastern décor, matched with a delish Turkish and Mediterranean cuisine, set atop a beautiful terrace; this place scores high on both the taste and ambiance. Go here with your squad for a hookah night! Oh, and the bread here feel straight out of the oven. A soulful evening awaits you and your friends at Sutra Gastropub. The live music with open-air seating and some heady cocktails makes for a very inviting evening. Surprisingly there’s a tree popping out in the courtyard that really brings the place together. They have a mean Red Ferrari and Clue Queen mocktail that are must try. Loved these rooftop restaurants? American Express brings you exclusive privileges with an exciting selection of year-round dining offers for all Cardmembers. Make your evening memorable with the American Express Membership Rewards® Credit Card by availing a world of benefits and rewards, with the lifetime free* membership by clicking here.